Latest Version: 3.6 Released on Dec 25 2018. Free PDF To JPG Converter is designed to convert PDF files into wide range and high quality know JPEG image format in batch mode. This software is an useful utility when you needs to convert PDF documents to JPG or other raster image formats (PNG, BMP, GIF, TIFF) in office or home work. 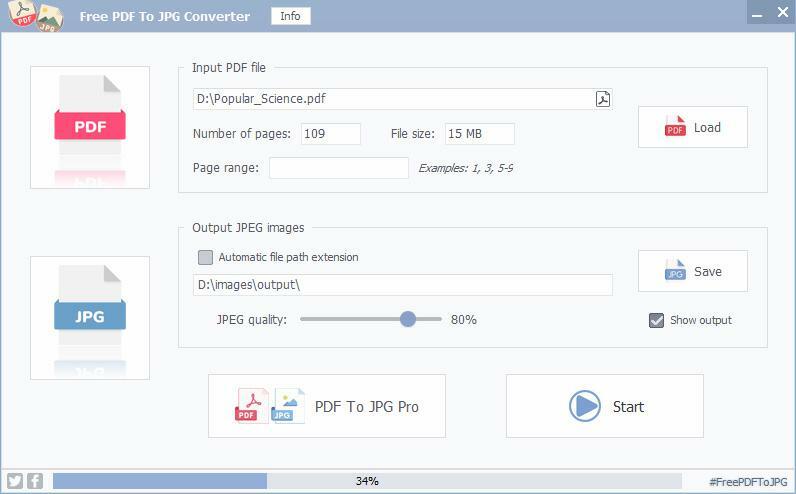 The Free PDF To JPG Converter application has a lot of valuable built-in features, such as file list handling (open/save, drag & drop function), built-in PDF viewer, page-range setting, image quality, antialiasing, transform support and many others. The downloadable Free PDF To JPG Converter desktop software is a batch PDF to JPG conversion tool for free in any use. It is an excellent utility for implementing PDF document data archives or share PDFs as JPEG and other image formats what is you need. PDF file conversion procedure of Free PDF To JPG Converter has never been so easy before. Of course the source document's layout, images and text results of Free PDF To JPG Converter are fully preserved during the conversion on each page. Some demo functions are also included in the free app from the professional PDF to JPG converter. Let's see and simply click on free Video Tutorial on the sidebar to see how this amazing free PDF to JPG converter works! Released on: Dec 25 2018. New installer with code signing certificate granted by Comodo. Official name of the application is changed to Free PDF To JPG Converter. Packed installer with PDF To JPG Converter Pro. Changed used platform from Java VM to native Windows binary. Large number of GUI updates. Added a new visual watermark profile designer subsystem. This completely free PDF to JPG converter is a batch mode software for intelligently convert PDF files to JPG images. We're sure it can help you to convert hundres of PDF documents to a bunch of JPG images. If you want to use this free software, just click on download image above and install it with a few simple clicks! In one sentence Free PDF To JPG Converter is a Windows-based desktop application for fast converting PDF files into JPG images. But if you're a severely online surfer, please refer the following link to using an online solution for PDF converting. How to convert PDF documents to JPG images for free?